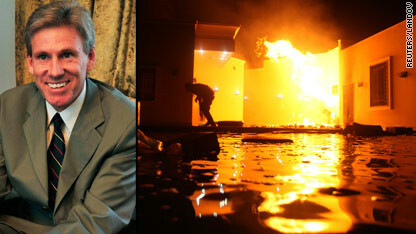 A rocket attack on the US consulate in Benghazi kills Ambassador J. Christopher Stevens and three others. In Cairo, protestors climb embassy walls in protest over anti-Islam film on Tuesday. Below are CNN’s reporters covering the story on all of CNN’s networks and platforms. Elise Labott, Foreign affairs correspondent, Washington, D.C.
Jill Dougherty, Foreign affairs correspondent, Washington, D.C.
Suzanne Kelly, Intelligence correspondent, Washington, D.C.
Juan Carlos Lopez reports from Washington, D.C.
Find the latest news on CNN.com’s live blog, This Just In, and live streaming on CNN.com/live.